A silver filigree container with fish shaped handles, made in two parts. The entire container is decorated with an intricate filigree design of stylised leaves and scrolling tendrils. A delicate filigree knob made to look like a flower bulb functions as a handle to lift the lid. The lid flares out gently and is richly decorated with stylised leaf designs. The main body of the container is of unusual shape and is decorated with different designs; the central band has two layers of filigree work on top of one another. The body sits on a high outward flaring foot of leaf design. The handles are shaped as upward, dolphin-like, jumping fish. Filigree is a delicate kind of metalwork. The English word filigree is derived from the Latin ‘filum’ meaning thread and ‘granum’ meaning grain. Tiny beads and twisted threads, usually of gold or silver, are soldered together or to the surface of an object of the same metal and arranged in artistic motifs. It often suggests lace and was popular in Asia. It became popular in Europe from the 17th century to the late 19th century. 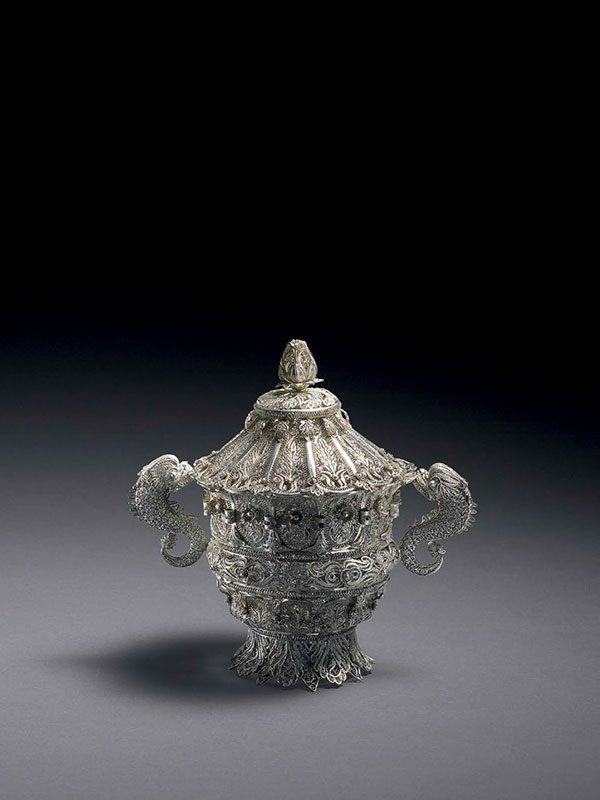 This highly unusual filigree container was possibly used to contain fragrant leaves. It was probably manufactured in Goa. The fish shaped handles are highly unusual.